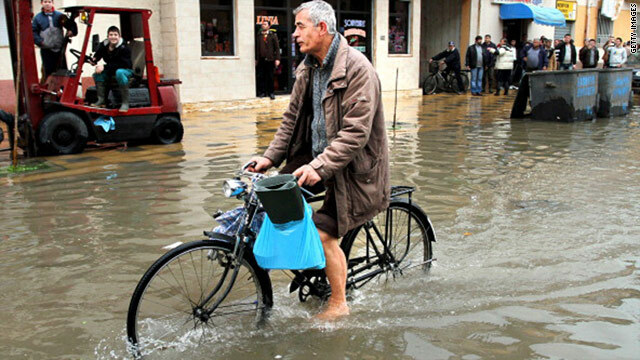 A man rides his bicycle in Shkodra district, some 75 miles (120 kilometers) northwest of Tirana, on Wednesday. (CNN) -- Torrential rains have forced the evacuation of 12,000 people from their homes in parts of Albania as floodwaters wash over roads and cause massive landslides, the country's government said. More than 2,500 homes have flooded and more than 13,900 hectares (34,500 acres) of land are underwater, according to a statement from Albania's president after a late-night government meeting Saturday. Officials have declared a state of emergency in affected areas as rains triggered massive floods, the statement said. Albania's official ATA news agency described the situation as "critical" Saturday, with many major national roads impassable. Troops and police were assisting in rescue efforts, ATA said. Residents in at least one neighborhood in the northwestern city of Shkoder were forced to use boats to travel, ATA said. Alban Thika, who took pictures from a rescue helicopter used to distribute food to isolated homes, told CNN's iReport that nearly a quarter of the city had flooded after three weeks of heavy rains. "If you look through the pictures, you would think there is a sea, but it's all land covered with water," he said. Albania has asked for assistance from NATO, Thika said, but more aid is needed. "These people are all stranded. They're getting very little help," he said. CNN's Aliza Kassim and journalist Sokol Balla contributed to this report.